Today is One Room Challenge Reveal! Finally! Such high expectations all around- so I hope the photos don't disappoint you. I need to tell you, as a disclaimer, how difficult it was to take the photos. With the large windows and so many reflective surfaces it was a nightmare. I hope they convey the real beauty of the room. This One Room Challenge was started by Linda from Calling it Home some years ago. 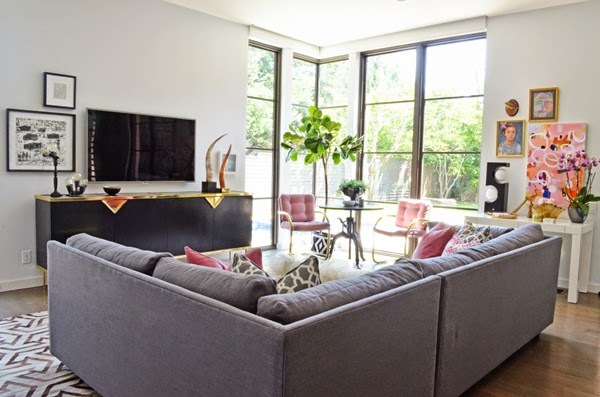 In this challenge she lines up twenty talented interior designers and professional bloggers to redo a room in their home in just six weeks- we update you once a week on Wednesdays. And today is not only Wednesday but it also the BIG REVEAL. I decorated our family room. (In case you missed it here are the previous posts). Without further ado- Our Family Room. Let's start the tour with this bright corner. Originally, the acrylic chairs were supposed to go around the table, which left these two pink beauties (from Olive and Sabrina) hidden behind the sofa....but I could not bear it. Aside from them being so comfortable, they are also just spectacular so I changed them to this corner where everyone can enjoy them visually, plus they make the corner more inviting and integrated with the rest of the room. I just love how they dress up this bright corner. Also, I'm crazy in love with my faux fiddle fig tree. It was less expensive than a real one and I don't have to stress over it (and with my black thumb this is exactly what was going to happen). Since both of our families live abroad we travel often for extended periods of time making it difficult to keep a finicky tree. Perfect solution. Also, I'm loving the succulent arrangement here. They get the perfect amount of sunlight. 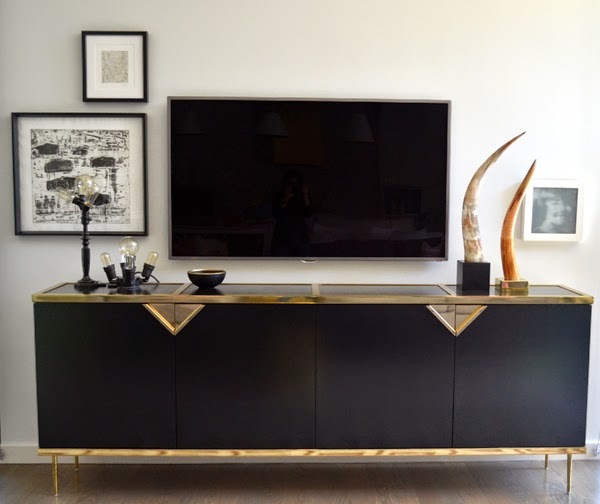 And here is my beautiful wood and brass credenza in all its glory! You remember when I blogged about its design here. It is really fabulous in person. A bit elegant, but goes nicely with our open kitchen concept. I wanted the styling around the TV to be simple yet powerful (too bad TVs have to be so ugly and large!). 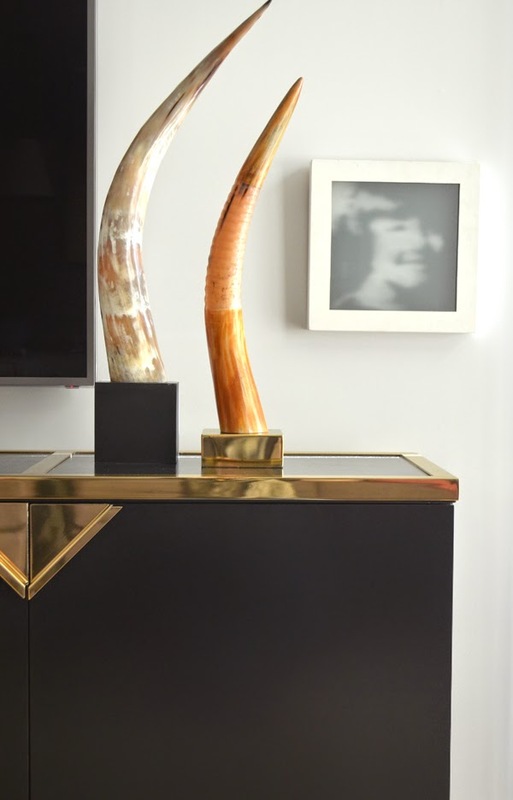 I love the large horns on one side and my husband's lamps together with my very talented friend's artwork in the other. 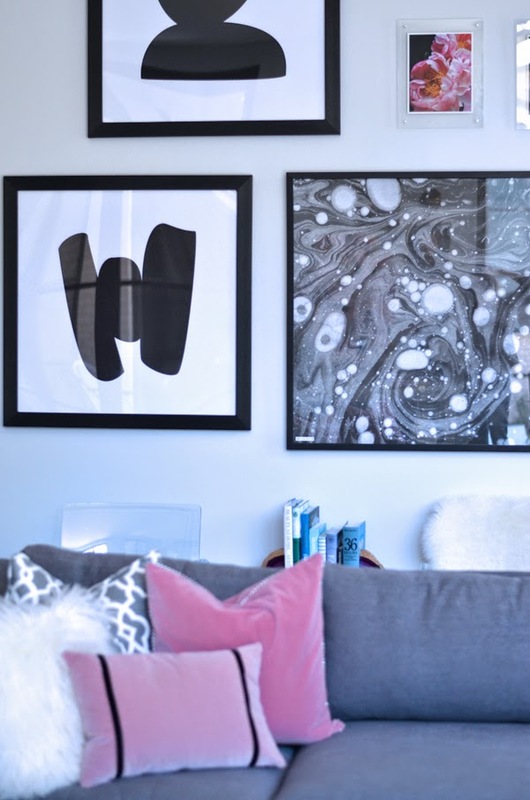 The large graphic prints from Minted really add personality to the room and pair perfectly with the marble print. I loved mixing these with Gaby's peony photographs to soften the look up a bit and tie in the pink to the rest of the room. The acrylic chairs are perfect for extra seating when needed. These two photos below will give you a sense for the three walls and how they related to each other. The sofa is so comfortable by the way. Behind the sofa is the kitchen (for those curious minds wondering about the fourth wall). And now to what I like to call the pink wall. In this mostly pink corner, I just love the pop of black here from the Lamps Plus lamp. I love its retro look paired with all that bronze yumminess. Can I tell you how much I love my brass peacock? I bought from Tobe from Because It's Awesome. I saw it in her photos during one of the beginning weeks of the One Room Challenge and emailed her asking whether it was inventory for her store or whether it was for sale. And I totally lucked out because it was for sale. Tobe finds the best brass items. She is currently stocked up with beautiful pieces that you need to see now before she sells out. 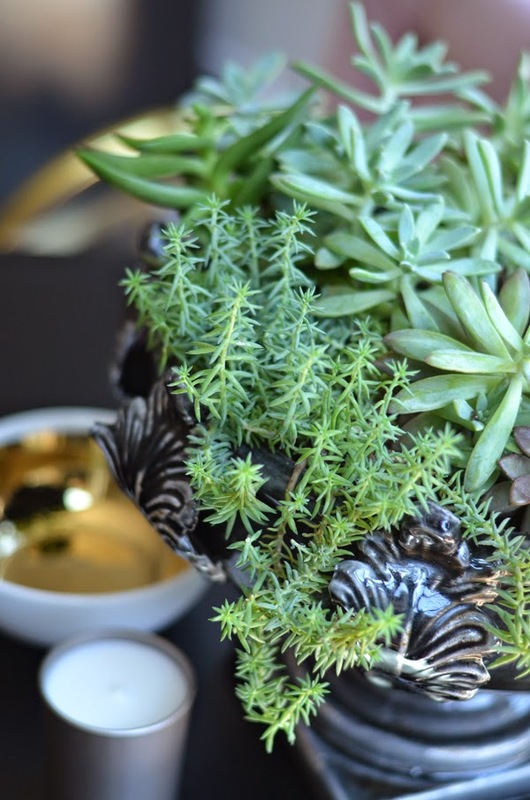 And the brass planter?! 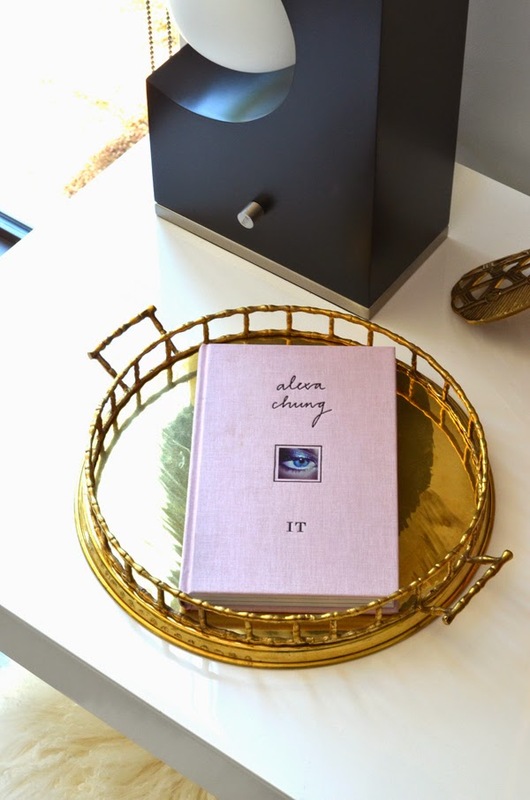 Another piece of heaven in this vignette from Charmaine's Olive and Sabrina store. Charmaine has special powers for finding the best furniture and accents. She scours Craig's List in different cities and blogs about it. 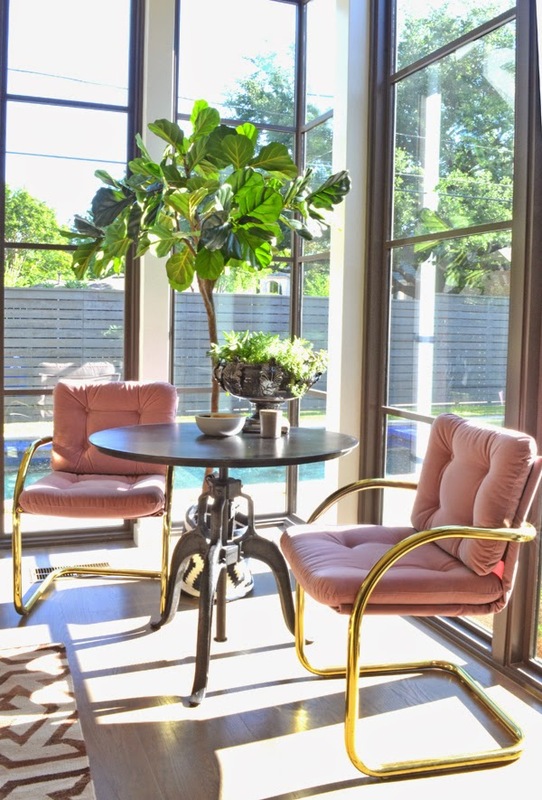 The pink chairs are from her, get her blog on your reading list asap! Also, the mongolian lamb stools are one of my favorite DIYs ever. I have my very talented friend Nadia to thank for that creation (she was the mastermind behind that beauty of a stool). And you all know Jenny Andrews' fabulous work right? Her store is brimming with beautiful art right now. Get it. That portrait is supposed to be my daughter. Not even close, plus the little girl looks mad. But I like its colors and composition. And did you see that small fish? I caught it in camp when I was 9. And I was able to score one of Sally King Benedict's face pieces. Love it. Below are some other details. Around the sofa I wanted a dynamic and free space so I avoided a coffee table. Yet, my husband was in dire need of a surface to put the hot milk he likes to drink at night- enter the perfect compromise: a fabulous and small gold tree stump. 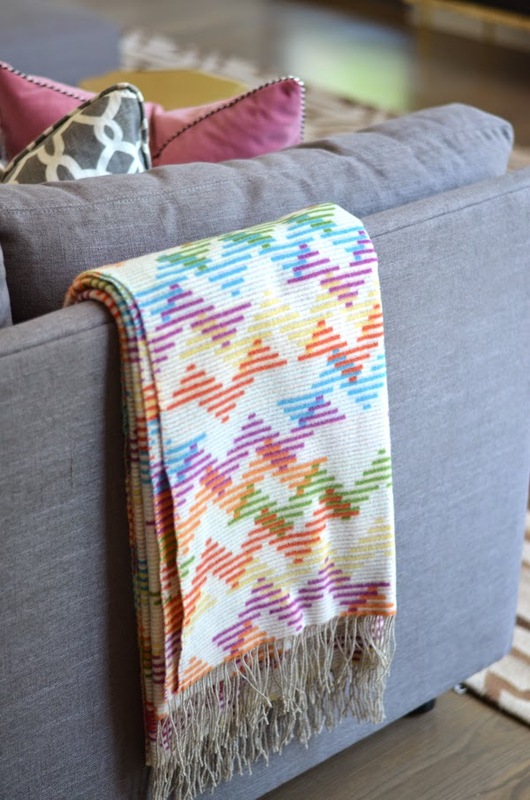 The Missoni throw was an impulse buy from Gilt. I had a long-standing credit of a few things I had returned. I thought the blanket was the perfect combination of beauty, luxury, coziness, and sale price. I love the pink peonies behind the pink pillows. I love, love our new room and can't wait to start really living it and gathering family and friends here. A huge thank you to Linda for organizing this amazing challenge and for permitting me to be a part of it. Working tirelessly, Linda has built an amazing enterprise with this series that truly unites so many talented bloggers around the world. This is no small feat. 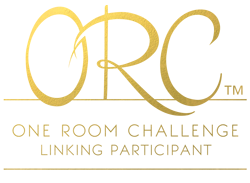 The One Room Challenge has been an unbelievable experience, not only because it forced me to attack this room head-on but also, because it connected me to such a supportive and unbelievably talented group of designers/bloggers from all around the world. Thanks Linda!! AMAZING!!!!! Seriously so stunning!!! You rocked it! It's stunning!!!! What a wonderful job! I'll be moving in this weekend if that's okay. Don't worry about a bedroom for me, I'll just squat in that very room. The couch looks like a dream to sleep on. Albertina!! Your room looks so gorgeous. Great job, my friend. I. love. every. single. detail. This is gorgeous. It looks straight out of a shelter magazine. Great eye and great job!! I'm dying over your room. Love all of the art and how bright the room is. The colors and styling are perfect. What a gorgeous room!!! Shut the front door. This is amazing!! Obsessed! Beyond fabulous!!! Such a fun mix of colors, textures & patterns !! Speechless Albertina, speechless! What a talent you are! I adore the color palette, I am dying over those pink chairs with gold details. Love how you styled each and every corner, bravo!! LOVE! oh my gosh albertina, it's SO amazing and SO you! seriously, i can't believe you did this so fast. the pink corner is just gorgeous and the styling is perfection. what i would do for all that natural light. thanks for sharing your beyond beautiful home! Holy cow. I want to live in that space! Glorious job you did. Everything is stunning! Congrats. Beautiful! Love the hits of pink and gold - great job. For once I don't know where to start, that's how much I love everything in your room. Congratulations. Your room is so beautiful. The pink and gray is perfection. Wow! Love this room and your credenza is really to die for!!! The brass legs are gorgeous! Congratulations Albertina, you're so talented! And also a great photographer as I saw you already took the pictures for the Pink Pagoda! When can I move in??? 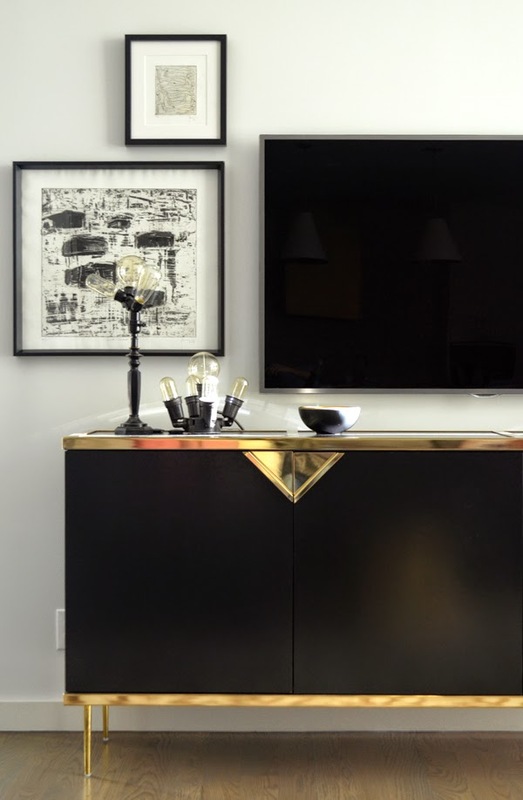 Your art collection is ridiculous and I am especially enamored with your credenza tv styling. That couch is luxe. I want it. Basically I want the whole room. Well done! Love it. Where did you get the fiddle leaf fig tree? I am obsessed! This space is incredible. 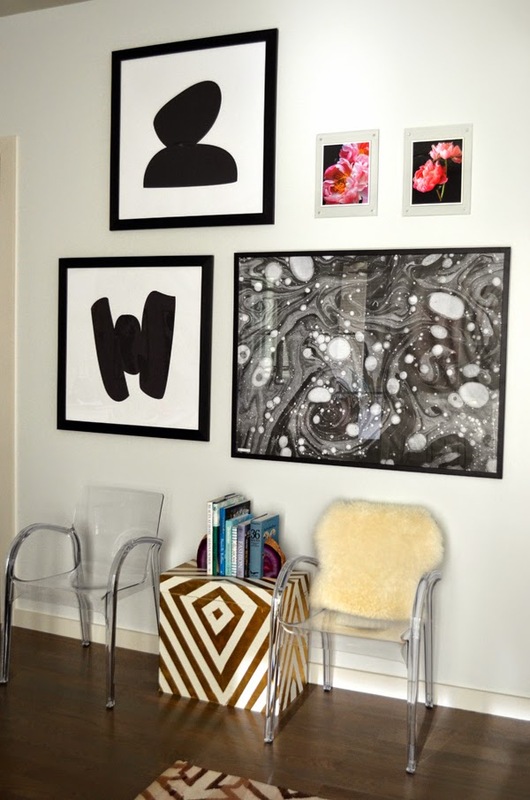 I want those furry stools and the pink abstract please:) BRAVo! Such a beautiful room. That credenza is gorgeous and all the lighting and art. Awesome job! OF ALL THAT'S GOOD AND HOLY...this is incredible!!!! 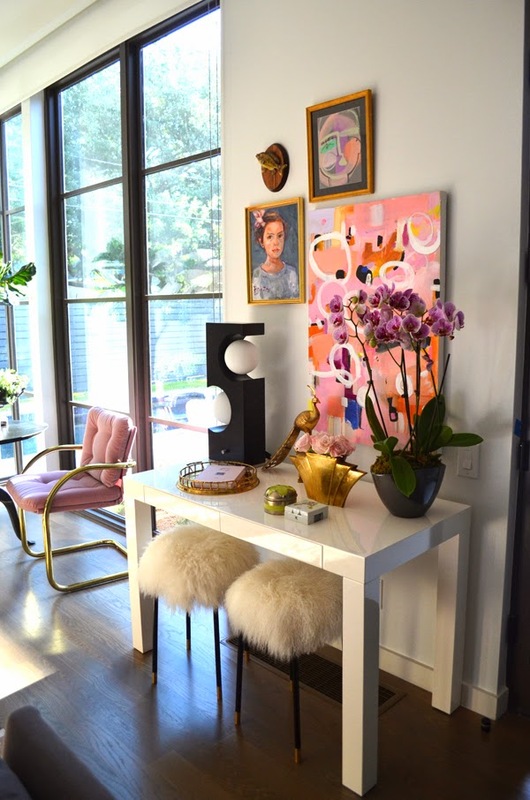 My eyes are seriously bulging out of my face over those pink chairs, the fur stools and the credenza...the credenza...I've never loved one more- it's perfection...the whole room is. All of the art is amazing and I am so inspired by how you organized/styled all of the pieces...so unexpected and fabulous. You are a shining star my dear- this is amazing x a million. Love, love, love. Absolute perfection!! 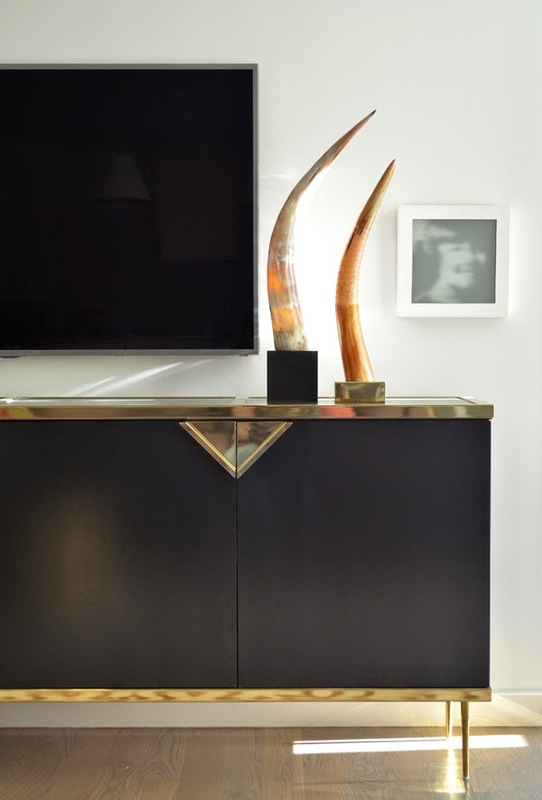 I am in LOVE with that credenza, and the art deco brass vase! Every single detail is to die for, and of course I adore all the touches of pink... you did such an amazing job!!! This room deserves to be in a magazine! I'm in love!!! I want to come over and soak it all in. Every inch is so well done my friend. Simply beautiful. So so good Albertina!!!! I'm infatuated, it is chic beyond words, Albertina!! 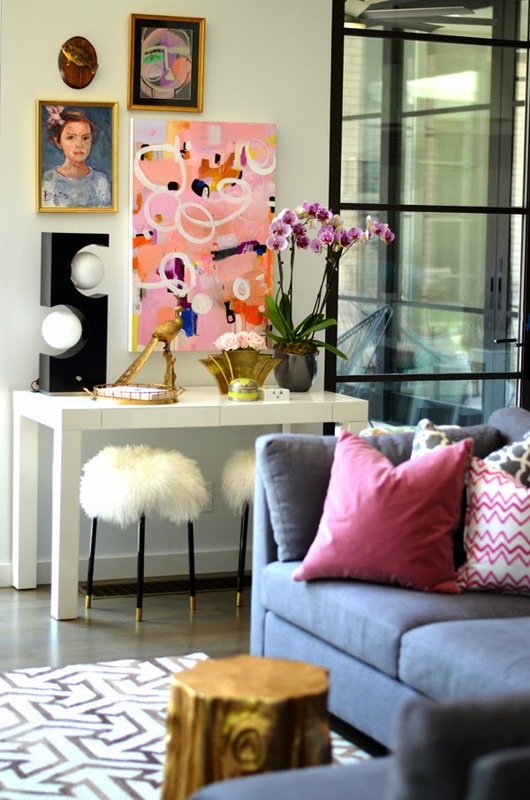 The pink abstract and accents throughout are so fabulous and that credenza is crazy amazing! 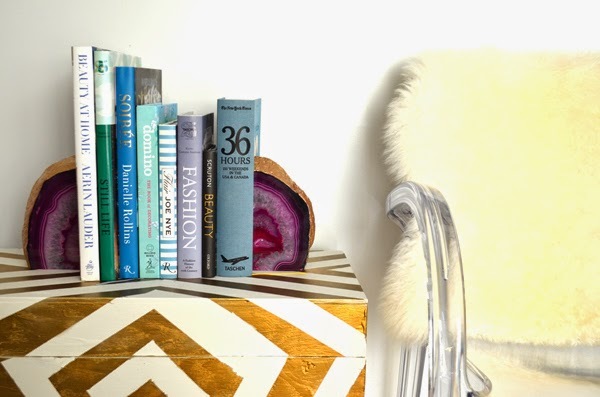 Love your nook and your attention to details and styling is so exceptional! Absolutely gorgeous! This room looks so luxe and super high end. LOOOVE all the amazing light it gets. Just beautiful. This is by far my favorite one room challenge!! So inspired!!! Great Job!! Stunning!!! This is my favorite room by far!! Great job and so inspiring!! Do you have details for the gold chevron cube in between the acrylic chairs? It's actually a DIY. A large wooden box that I painted white and then taped and spray painted gold! I love the pink, black, and gold - my favorites. This room is spectacular. Your styling is so good. Amazing. Such a beautiful and stylish room! I really love the accessories and unexpected details! Oh Chica how I stalked ur blog for this reveal! And it's everything I expected. Stunning, stylish and full of swagger. 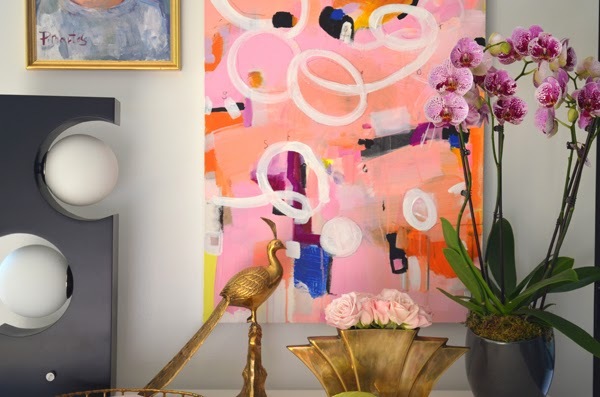 Blown way by the credenza, the punches of pink via the pillows and chairs, the console table with the Mongolian stools. You rocked it out for sure. Now go and live in it! I love so, so many things about this room! 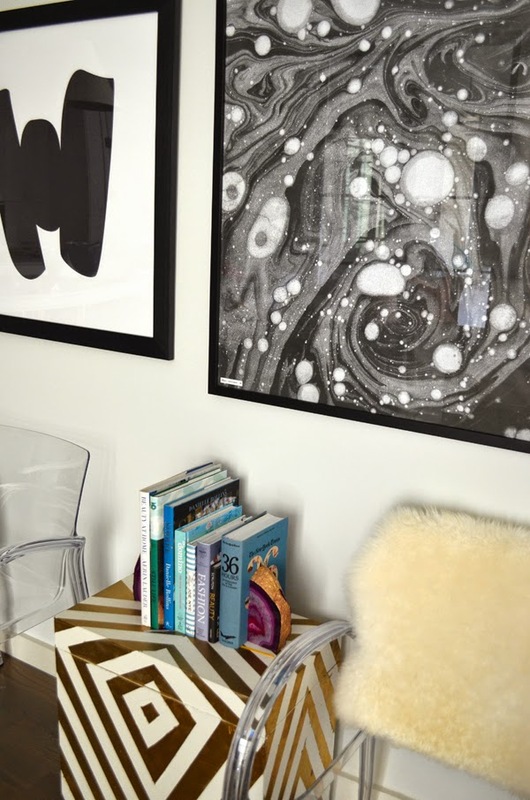 Especially the couch/pillows/credenza/art/THOSE STOOLS!!! Seriously so good - you have a fantastic eye Albertina! ALBERTINA. This is stunning. I love every detail! SO good. Okay okay okay, let me catch my breath because this space totally took it away! It's beautiful. I love all the pink details, but it's not overwhelmingly pink. The black and brass really balance it out perfectly. YOU NAILED IT. Bravo and congrats a million times. it looks amazing! the whole space is elegant and livable. perfect for a family room! You are so sweet, Albertina, thank you. I am just in love with those windows and how they ground the entire room. 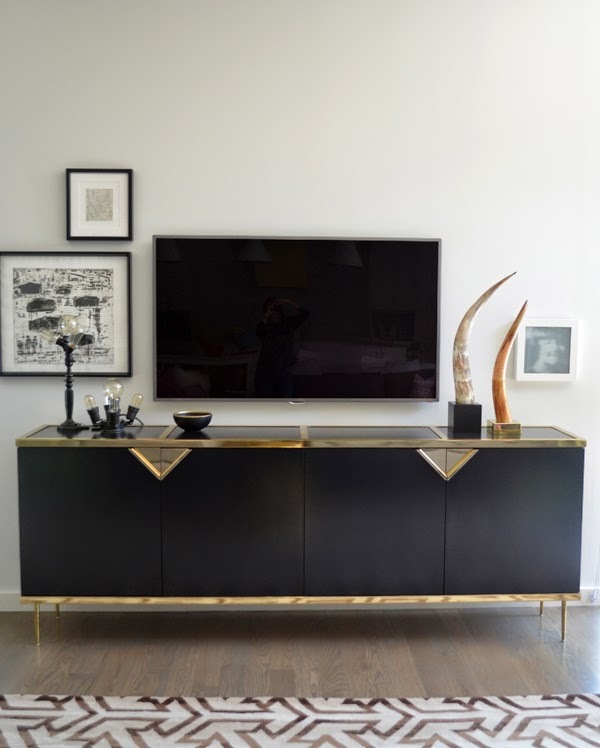 The credenza, art, furniture, all of it is so lovely. This is so well thought out and you can feel the love that you put into this space for your family. I would sit at that table in the corner, and never leave. Great job. I am in love with your living room!!! Great job, it looks fantastic. I'm so happy to see that you found the perfect horns. 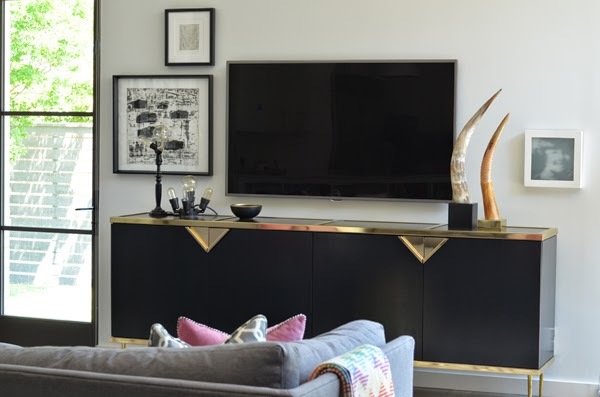 That credenza is stunning, I think it's my favourite item in the room. This space could not be more beautiful! What an amazing transformation. I love all of the fabulously styled details. Congratulations on an amazing space! That art gallery has to be my FAVE vignette of the entire space! So creative and filled with amazing ideas, I love that you've anchored the space with the media station and allowed every corner to sing a different song. All the personal touches makes for such an intimate room while in a grand space- fabulousssss!!! This is such an amazingly beautiful, collected space! I love everything you have done!!! Your room belongs in a magazine - for sure!! 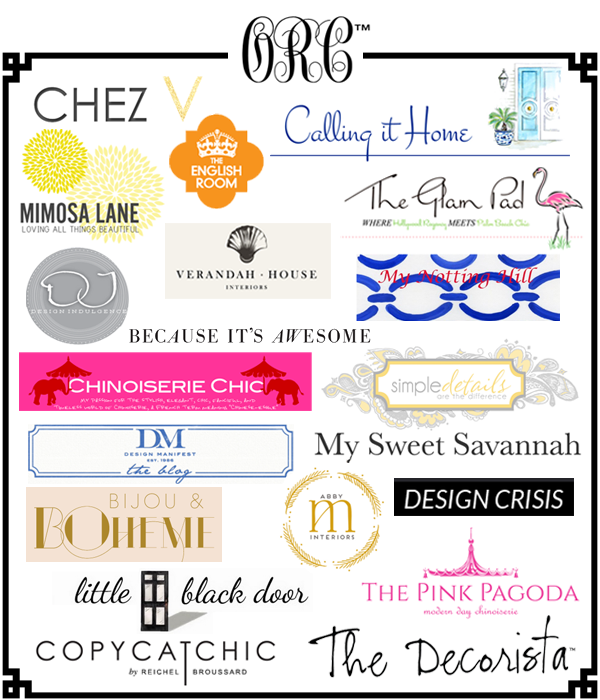 Fabulous job, love everything being so chic yet still family-friendly! Tough one to combine! that is a fantastic room. period. well done. Amazing! I love it all, great job! Love all the color, especially that sofa. What a great space to hang out in! 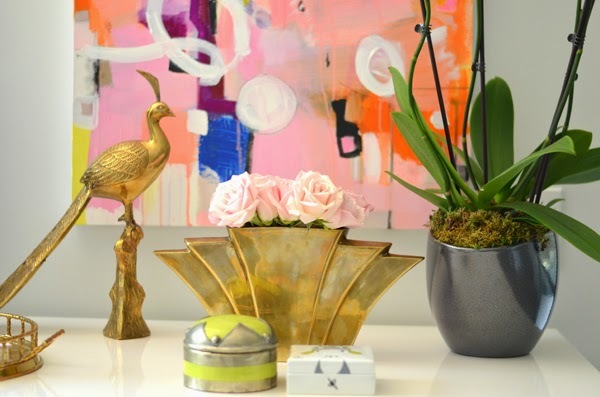 Albertina, this turned out so beautifully … I love love love the pops of gold and your art pieces!! Congrats! Oh just stand there all smug with your fabulous room why don't cha! Really....It is screaming come on in people and bask in this cool space! Can't really pick a favorite but I do love the way Jenny's art pops out with a huge wave! It's stunning and perfectly edited....great job and I hope you and your family really enjoys this space! Love Love Love it all! Love all the details and how you styled everything! So Pretty! Fantastic space! I don't think I can choose a favorite aspect. I would love every single thing in my home. Can I just say that this is one of my favorite room makeovers ever! Although I'm not sure what it looked like before, I just think the color palette is gorgeous and those chairs are beyond fabulous! Great job Albertina! Albertina!!! I am speechless. This room is phenomenal! It is SO CHIC! Be still my heart! Albertina I cannot stop staring! 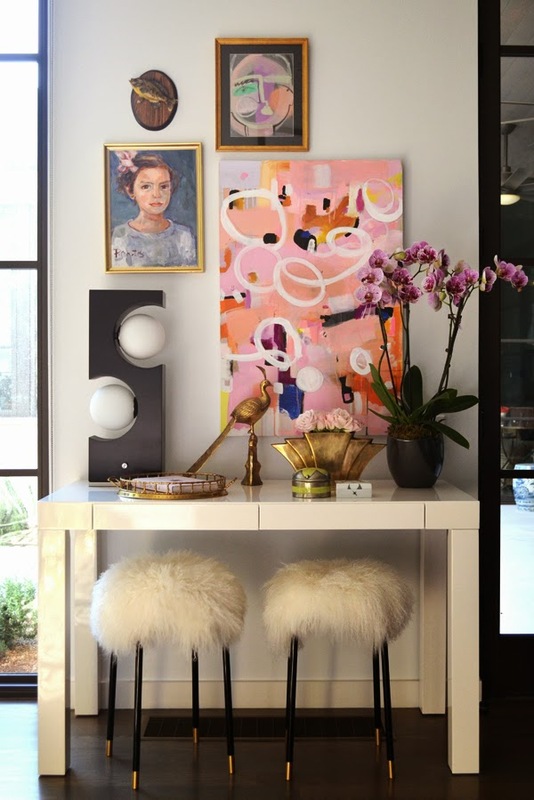 LOVE the pink, gray, the art, the stools, the console, I mean EVERYTHING is FABULOUS! Sorry I am not yelling I'm just excited! BRAVO! Beyond Stunning! Your Family Room should be gracing the pages of any Fabulous Home Interior magazine! Your Styling is perfection! Great Job Albertina! Wowowow! So perfectly chic in every way!!! Gorgeous! Absolutely LOVE what youve achieved here! The placemwent of the pink chairs was clever and your credenza creation is simply stunning and unique. Congrats on a beautiful room and thank you for sharing it with us! So. This needs to be in Elle Decor. Like right now. It is BEAUTIFUL!!!!!!!!!! Albertina! You did not disappoint! I love everything! You've managed to appeal to all my senses and your use of colour and texture is remarkable! Bravo!!!! TDF !!! So beautiful. I want to buy those brass legs now. The entire room is absolutely stunning down to every single detail! I'm in love! Obsessed. Stuff of my dreams. All of it. This is absolute perfection, Albertina! You had a beautiful space in which to work and you made it beyond incredible. Every single detail is amazing. What a talent!!! Per ushe (sp? ), I am late to the party. Moving right along: you are my hero. This space defines style. I seriously couldn't even dream something this amazing up in my head, so thank God for the inspiration from you. Just. Wow. Lemme process it a bit more and circle back with something a little more articulate and a little less obnoxious? K thnx. And xo! What a stunningly beautiful room. Feminine, yet edgy and minimally masculine. You struck the perfect balance. 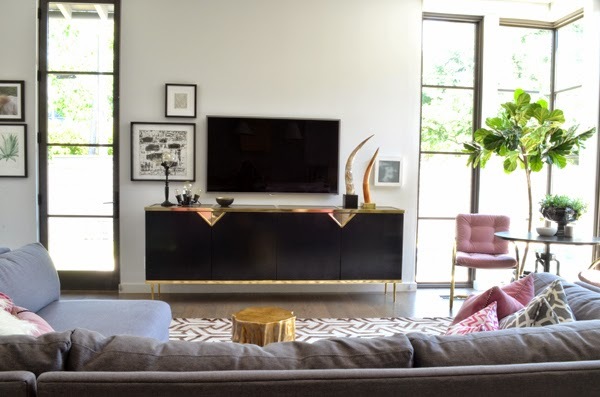 The credenza is my new obsession, and congrats, you have just inspired a new DIY project for me. Congrats on this space, and your new house. Your taste is impeccable. I can't even handle how fabulous this space is! What a beautiful new home you have! Everything from the colors to the gorgeous pieces came together so perfectly! Yours is by far one of the best ones! I checked them today and what you did is incredible!! Is all perfection! I've been following along since week one and I really had no clear sense of what your "after" would look like. It is incredibly beautiful and stunning! What a gorgeous room and an amazing blend of beautiful objects. Bravo! Wow, such a great room! Love all the beautiful detail and the colors! OK, your photos are stunning, cheers on being your own best storyteller! Seriously, I can relate to getting the right light. The room design is flawless! You have really made this room part of your home! 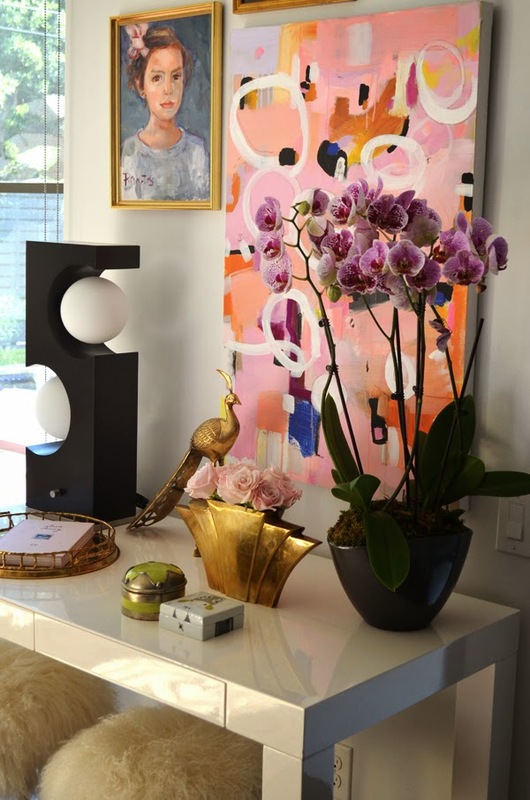 I love that gold tray and the portrait and art work are a great fit with the room! Cheers on a job well done! So fun to see the progress of your room and participate in ORC with you! Albertina I am in awe of your beautiful eye and talent. This space is chic, modern, original, and sweet - just like you. BRAVO! Albertina- what a beautiful job you did with this space. So many good moments come together and result in a sophisticated and artful space. I love how you incorporated new modern pieces with both vintage and things you made yourself. The credenza is to die for and I know each time you look at it, you must get a thrill knowing it was your concept brought to life. One of my favorite rooms of the challenge and certainly one I'll always come back to for styling inspiration! Holy cow! I could spend hours dissecting the beauty in this room! You did an unbelievable job! That credenza in unreal! And you styled this space with such a refined hand. I seriously LOVE everything. I must say that I could stare at the pink wall all day! It has been so much fun following along! Well done! Love this! Where are the pink pillows from? 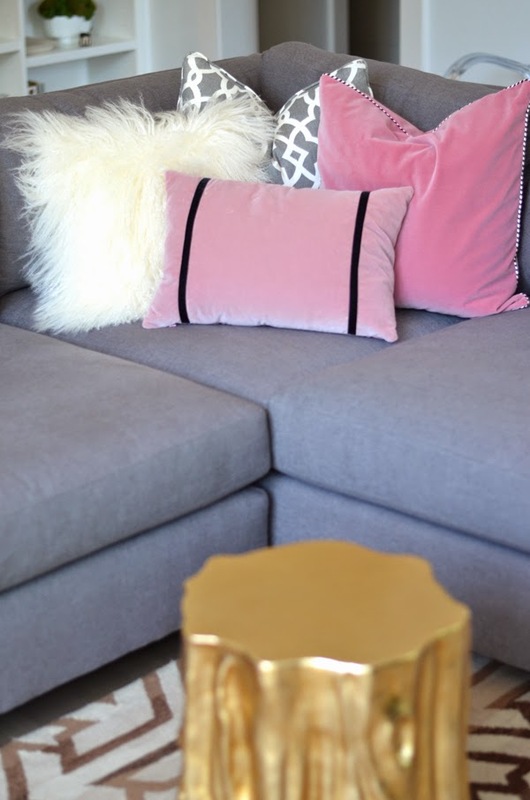 the pink pillows are custom made from the same velvet fabric from the chairs. I wish I could point you toward an online shop! I luv your style, especially the brass and pink! Your color palette is great could you please tell me the wall paint color?